General: The Blue Jay (Cyanocitta cristata) is a North American jay, a bird with predominantly lavender-blue to mid-blue feathering from the top of the head to midway down the back. There is a pronounced crest on the head. The colour changes to black, sky-blue and white barring on the wing primaries and the tail. The bird has an off-white underside, with a black collar around the neck and sides of the head and a white face. Blue Jays reside over a very large area of the eastern side of North America from northest Newfoundland to southest Florida, western Texas and Midwestern United States, and north to central Alberta. It is mainly a bird of mixed woodland, including American beech and various oak species, but also of parks and gardens in some towns and cities. West of the Rockies, it is replaced by the closely related Steller's Jay. Its food is sought both on the ground and in trees and includes virtually all known types of plant and animal sources, such as acorns and beech mast, weed seeds, grain, fruits and other berries, peanuts, bread, meat, eggs and nestlings, small invertebrates of many types, scraps in town parks and bird-table food. 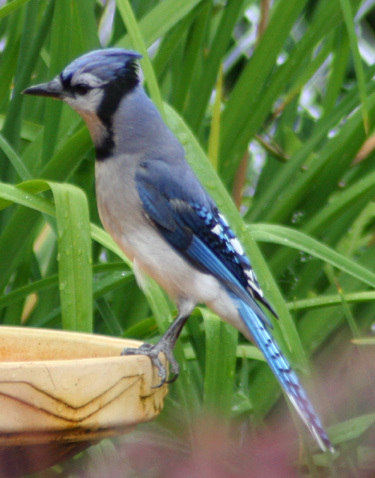 Being clever and adaptable birds, Blue Jays are good survivors and have adapted well to human presence; however, their occasionally aggressive behavior at feeding stations, plus a reputation for occasionally destroying the nests and eggs of other birds, have made them unwelcome at some bird feeders. In captivity as well they are generally aggressive toward other birds. Any suitable tree or large bush may be used for nesting, and both sexes build the nest and rear the young, though only the female broods them. There are usually 4–5 eggs laid and incubated over 16–18 days. The young are fledged usually between 17–21 days. Blue Jays typically form monogamous pair bonds for life. Although this bird is generally found year-round through most of its range, some northern birds do move into the southern parts of the range. These birds migrate in the daytime in small flocks. The voice is typical of most jays in being varied, but the most commonly recognized sound is the alarm call, which is a loud, almost gull-like scream. There is also a high-pitched jayer-jayer call that increases in speed as the bird becomes more agitated. Blue Jays will use these calls to band together to drive a predator such as a hawk away from their nest. 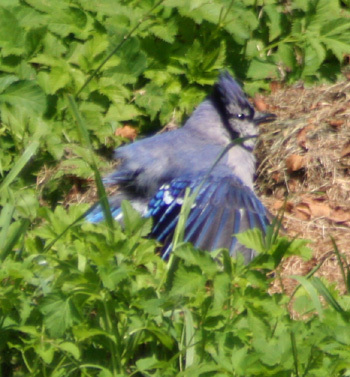 Blue Jays also have quiet, almost subliminal calls which they use among themselves in proximity. One of the most distinctive calls of this type is often referred to as the "rusty pump" owing to its squeaky resemblance to the sound of an old hand-operated water pump. In fact, they can make a large variety of sounds, and individuals may vary perceptibly in their calling style. As with other blue-hued birds, the Blue Jay's coloration is not derived by pigments, but is the result of light refraction due to the internal structure of the feathers; if a Blue Jay feather is crushed, the blue disappears as the structure is destroyed. This is referred to as structural coloration.